Thursday, February 23, 2017, 7pm, SomoS Artist-in-Residence Winter 2017, Social Art practitioner, writer, graphic novelist, educator and TV producer Christopher Sperandio presents his current work-in-progress on his graphic novels and will conduct a video-assisted artist talk about his work. Currently an Associate Professor at Rice University in the Department of Visual and Dramatic Arts, Sperandio works in Social Practice, an underknown art form rooted in the Conceptual Art and political activism of the 1960s, and has a strong affinity with the work of the Situationist International (SI), the 60’s anti-authoritarian international movement of avant-garde artists, intellectuals, and political theorists. Sperandio currently lives and works in Houston, Texas. He has produced television, comics, films and photographs, usually as projects for museums, art centers as well as galleries, including MoMA/PS1, Deitch Projects, and London’s ICA. A broadsheet published by SomoS, titled “Pinko Joe or Run! The Old World is Behind You!,” has been created by Christopher Sperandio for the occasion. It will be available on the opening event and during the presentation, until 28 February 2017. Pinko Joe or Run! The Old World is Behind You! I’m using public domain comic books as raw material for a new graphic novel series that is part political satire and part slapstick comedy. The central character is a Socialist crusader for human rights, dedicated to curbing the evils of out of control capitalism and corporate greed. 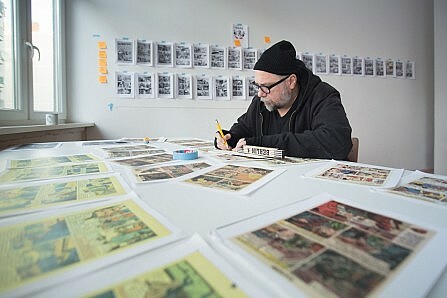 The process involves selecting stories from existing books produced in the US between the late 1940s and 1960, rewriting the stories, and then redrawing the result, sometimes faithful to the original and sometimes with necessary changes. Lettering, inking and coloring happening between digital and traditional tools. Volume One, entitled Pinko Joe was completed in October 2016. The graphic novel currently in the works is a follow-up story to ‘Pinko Joe’, with a working title of “Greenie Josephinie,” introduces a new female character, and draws influences from climate change deniers to the landmark court case Citizens United v. Federal Election Commission, and the resulting influx of dark money into the US political landscape. I’ll exhibit part of my odd process of stitching together existing works, and will talk about comics and about my historical involvement in Social Art practices, dating back to the late 1980s. Christopher Sperandio – Pinko Joe or Run! 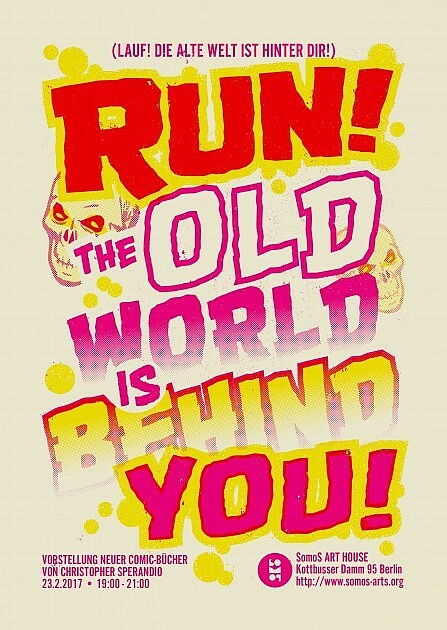 The Old World is Behind You!